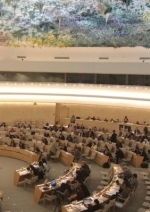 The United Nations Human Rights Council recently established a mandate for a Special Rapporteur on the promotion of truth, justice, reparation, and guarantees of non-recurrence. The decision to create this position received widespread support among the UN member states, with 75 states co-sponsoring the resolution. In this podcast Caitlin Reiger, director of international policy relations at ICTJ, discusses the objectives, qualities, and implications of this mandate on the field of transitional justice. The mandate proposes the comprehensive implementation of transitional justice measures, including reconciliation processes, institutional reform, and criminal justice. The position is also formulated around a victim-centered and gender-sensitive approach which Reiger emphasizes is a landmark step. While the work of the Special Rapporteur will inevitably face institutional and political challenges, the creation of this position with such widespread support demonstrates the ever increasing recognition of the importance of promoting truth, justice, reparation, and ensuring violations of human rights do not recur. Information on the process of nominating candidates for the position is available at http://www2.ohchr.org/english/bodies/chr/special/nominations.htm.